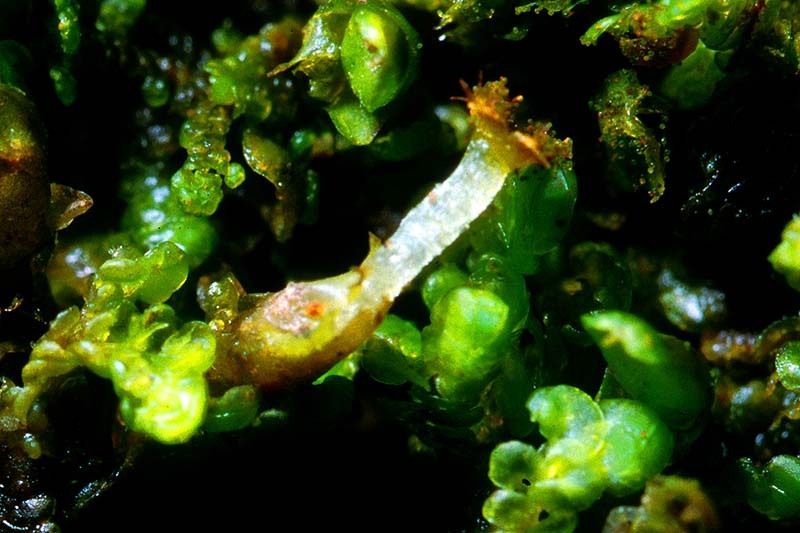 Frullania aterrima -A 2 cm long leaf of Hall's totara (Podocarpus hallii) with the branching axis of this liverwort on its surface. 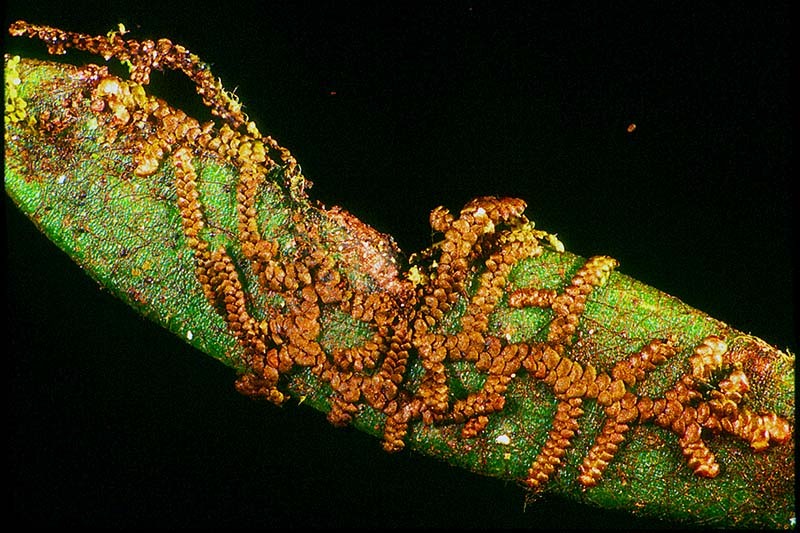 Frullania ptychantha - This specimen has completely covered a leaf of totara (Podocarpus totara). 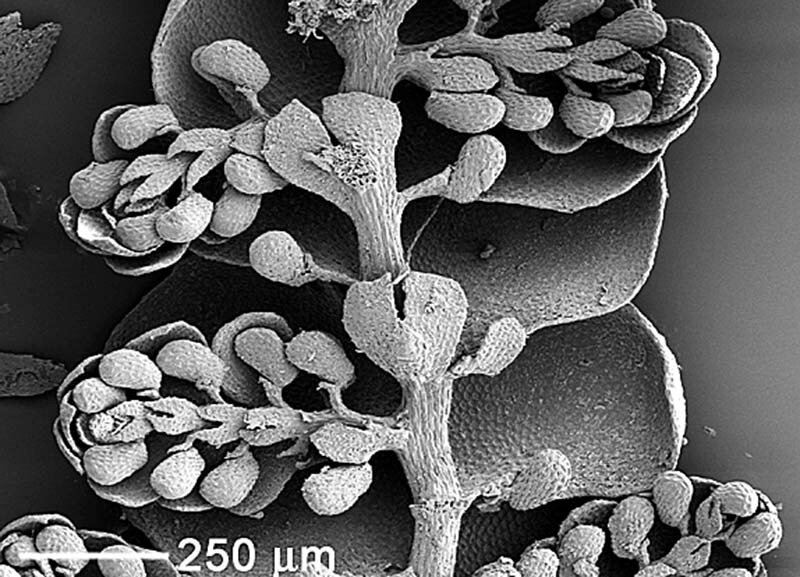 A bud-like structure (perianth) surrounds the developing sporophyte. Frullania apiculata - This is a view of the underleaves showing the slit at the free end of each leaf that is characteristic of Frullania species. 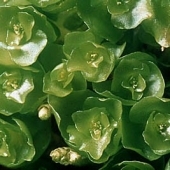 Small lobules are attached to the underside of the lateral leaves. 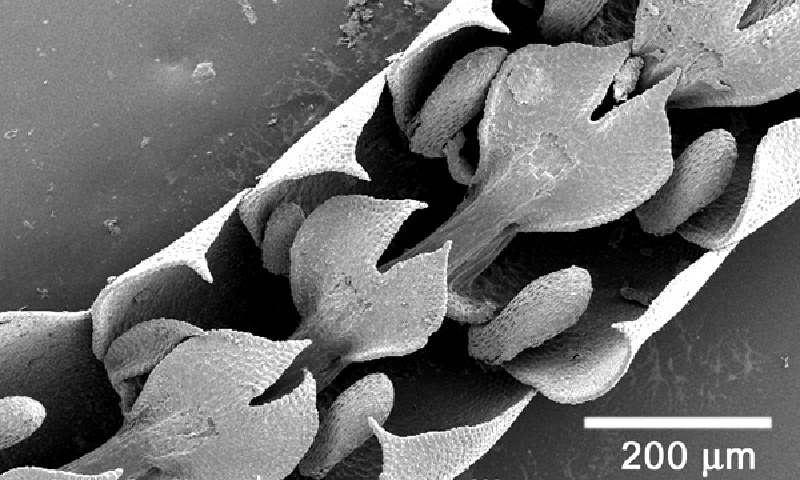 Scanning electron microscope (SEM). Frullania ptychantha - This species forms short side branches with small leaves (microphyllous branches) on the undersurface of the plant. Small lobules are attached to the underside of the lateral leaves. SEM photo. Frullania rostrata - A view of the lower surface of the stem with the underleaves removed reveals large helmet-shaped lobules on the lateral leaves. 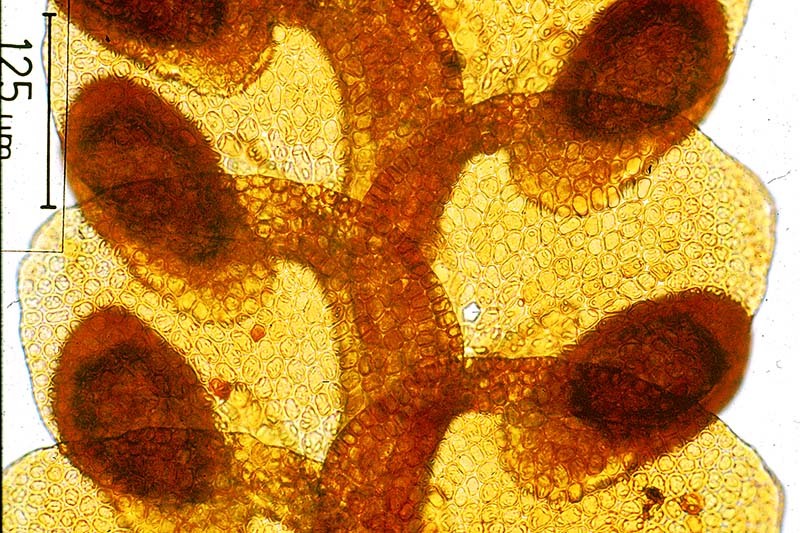 Frullania sp - Detail of the large helmet-shaped lobules on the lateral leaves. Frullania sp. 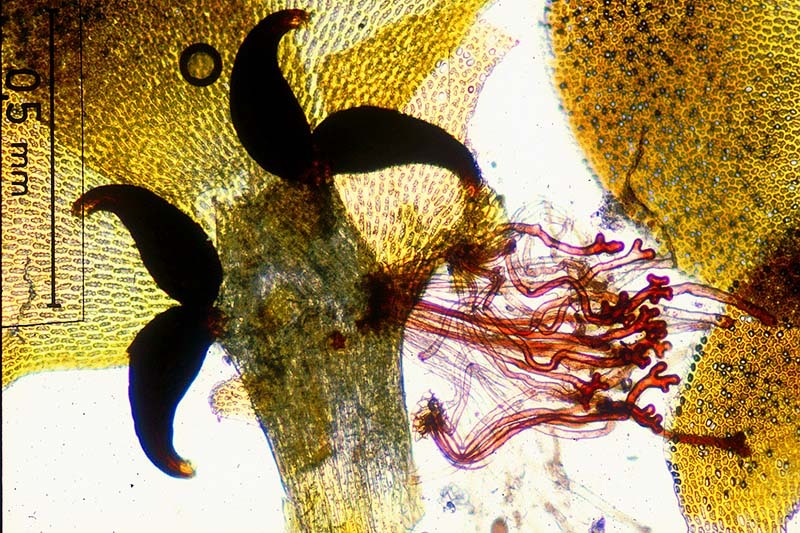 - A sporophyte has emerged from the perianth and the capsule has opened. 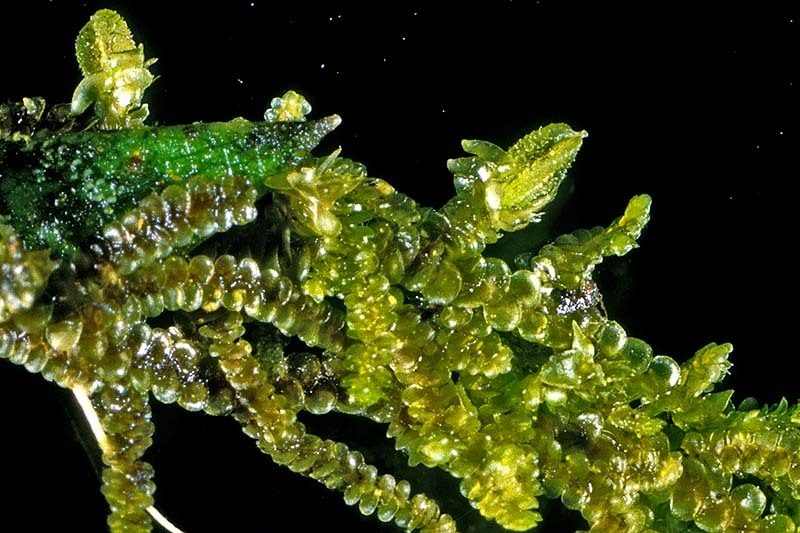 Frullania and Goebeliella species are often attached to other plants as epiphytes. Some are epiphylls, specifically favouring leaf surfaces. Epiphylls are uncommon because leaves are short-lived and their surfaces are often waxy and difficult to adhere to.